Now you can purchase the very same temporary tattoo formula and supplies used by Hollywood make-up artists to do tattoos for movies. You can see examples of these Henna tattoos on George Clooney in "Dusk 'til Dawn" and Sean Penn in "Dead Man Walking." 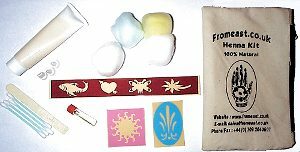 You too can do quality Henna tattoos at home with our TEMPORARY TATTOO KITS. Why use Fromeast Henna Kit ? Anyone could do it! Pre-measured for perfect consistency every time. Our paste lasts 12 months (versus 6 months with other kits on the market). No lemon/sugar solution needed. Use our reusable stencils or create your own. FromEast® is a natural product! If you have purchased the Henna Kit before and would like to buy additional paste tube then please click here. Why not take a look at some of exciting Henna Tattoo Stencils, please click here.